Imrul Kayes was born 2nd February 1987, in Meherpur. He is a Bangladeshi international cricketer who plays for Khulna Division as a left-hand batsman and occasional wicket-keeper. He made his first-class debut in 2006, playing 15 first-class matches and 16 One Day matches before being called up for the third One Day International between Bangladesh and New Zealand in Chittagong. He is a left-hand opening batsman, Imrul Kayes was the leading run-scorer for Khulna Division in the 2007-08 National Cricket League less than 12 months since making his first-class debut. Kayes soon made his way into Bangladesh's Academy team. With Bangladesh struggling to find a partner for Tamim Iqbal, Kayes staked his claim with impressive performances at the top of the order during the Academy's tour of Sri Lanka, and was rewarded with a place in Bangladesh's ODI squad to face New Zealand in October 2008. 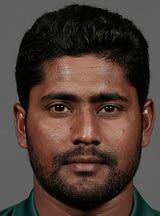 Find Imrul Kayes profile and stats of batting, bowling and fielding including latest updated news of Imrul Kayes, videos and images at Hamariweb.com. Also find detail Player profile and career statistics of Imrul Kayes of Bangladesh. Vhaiya you will never know how much i support and like u.bt my good wishes r prayers for u to succeed in life.i hope all your dreams comes true. Imrul Kayes - Find Imrul Kayes of Bangladesh Cricket Team complete player profile, number of matches, runs score, wickets & catches, Statistics, Records, Imrul Kayes Latest News, Imrul Kayes Videos, Imrul Kayes Photos, and other Imrul Kayes Cricket Team players.